If you’ve recently switched to a plant-based diet you may be under the impression that there are some foods you’ll never be able to eat again. I’m going to let you off the hook, you can enjoy many of the comfort foods you have always loved with a few modifications. This recipe does take some work, like any lasagna recipe there are many steps involved, most of the work is done by a food processor. The good news is many can be prepared ahead of time. I even build the lasagna a few hours before company arrives then put it in the oven 30 minutes before dinner time. Add all the ingredients for step one to a food processor, puree then set aside until ready to build lasagna. Add all the ingredients for step two to a food processor, puree, then set aside until ready to build lasagna. Building the Lasagna. Layer ingredients in a large casserole dish, I used a 9×15 dish. I used the following order:1 1/2 cup red sauce, noodles, white sauce, greens, mushrooms, eggplant then finish with red sauce. Repeat layers until you run out of ingredients. Mine had 2 layers of white sauce and 2 layers of greens with 1 layer of veggies (mushrooms and eggplant). I had three layers of red sauce. Bake in preheated oven at 350° for 20-30 minutes. This lasagna is company worthy. I’ve served it to large groups on two occasions and everyone seemed to like it. I don’t think you miss the meat or cheese from traditional lasagna. It also reheats well and keeps for several days in the fridge. It’s easily customizable. It pairs well with a large Italian salad, my salad included olives, artichoke hearts, peppers, red onions, and greens. For a faux parmesan try whizzing 1 cup of cashews and 1/2 cup nutritional yeast in a high-powered blender and sprinkling it on top of the lasagna. Do you miss Lasagna since going plant-based? Give this recipe a try, I think you will be pleasantly surprised. What comfort food do you miss the most? [Raising hand up in the air] I am THE BIGGEST snob when it comes to Italian food – very finicky. So when I saw this recipe posted my first thought was, “Yeah, right…” BUT – because we’re trying our best to have plant-based meals, I thought I’d give it a whirl. I was skeptical about all that spinach and how the nutritional yeast, mushrooms and eggplant would all come out but I can honestly say I can’t even tell where one begins and one ends – they intermingle in the sweetest of savory Italian flavor (how’s THAT for praise)! I think next time I will cut back the cayenne/red pepper though to 1/8 tsp. Knowing my husband though (I like little-to-no spice, he loves everything on fire), he’ll say to add more – LOL! Maybe next time I’ll have to make myself a little 8×8 pan. I used a 10×15 and I used everything up – noodles and all. For anyone planning to make this, I would say give yourself at least 1 hr. 45 min. for prep, baking, and cool down time. I used about 30 min. for chopping and mixing alone. Also, I think my oven runs cooler than yours; I used convection bake so maybe that makes a difference but I had it cranked up to 400 and it took a solid hr. in the oven. For anyone leery of eggplant, don’t skip it. I don’t think you could isolate it, especially if you did what I did and you food-process it with the mushrooms until it’s all minced. I then mixed it in with the spinach mix to hurry up the layering a bit and it turned out great. I forgot about the faux parmesan. It really doesn’t need it but I could see if someone was used to that visualization I’m sure it’d be a delicious addition. We have a LOT left over – I do hope it freezes well. Both my husband and myself can enjoy it while at work. If this red pepper intensifies though, I may have to leave it all for him to finish. Wonderful job, Holly! Was this entirely your own or did it come from HH? Oh! And I forgot to add that I omitted the salt and used whole wheat (non-GF) noodles. Yummilicious! HI Joye! I’m so happy you liked it! I will say that I left the eggplant in large bite size pieces and never noticed it in the finished product. You will have to let me know how it is after you freeze it. I’ve only served it to groups so we never had enough left to freeze. This recipe is all mine. I know Happy Herbivore has a lasagna recipe but I have no idea what is in it. I searched through a lot of recipes trying to find a gluten-free, dairy-free, and meat-free lasagna. I also wanted it to be soy-free because I was making it for Healthy Cravings and I didn’t know if anyone present would have an issue with soy. The white bean “sauce” works amazingly well here. You could omit the red pepper. I didn’t use it in my first attempt, added it to my second and didn’t really notice it. I prepared the different steps earlier in the day so thank you for mentioning how long it took you. I even build it early so my noodles may have softened up but I’m sure different brands could vary as well. I’ve only made this with No-Boil Gluten-free noodles. Once I find my recipe for salad dressing I’ll post it. Everyone at Healthy Cravings loved it! Mike didn’t get home last night until almost 8:30 pm so he missed out on it for supper. However, it was still out cooling and I was packing it away as he walked in. Without telling him it was plant-based, I had him try a big forkful of it. HE LOVED IT! (He took it to work today for his 12 hr. shift.) Micah (my 12 yr. old daughter) was standing right there and she jumped in right away and tasted some (the kids had something different for supper while I was waiting for this to bake). SHE LOVED IT, TOO! Always a hit when the kids like plant-based (my boys are not Italian food lovers so it’s a given they wouldn’t try this). I’ve not told her yet it’s meat and dairy-free. Should I? Nah. Congrats on coming up with this all on your own. I wish I was so creative! Before you know it, pretty soon you’ll be publishing your OWN recipe book! Kudos!!! Recently I decided to start eating plant based foods and was afraid I would not be able to find recipes I would enjoy. I have made several of your dishes and find them very satisfying, thank you. I had company over for dinner tonight and made the lasagna for them (keeping my fingers crossed they would like it). Well, everyone (adults, teens, and toddlers) loved it so much they had two to three helpings. Thanks again for being so creative. Keep the recipes coming. My daughter and I are just starting on a plant based diet. We don’t know what we are going to be eating. 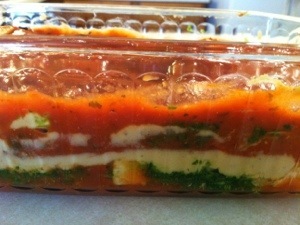 I have had so many positive reviews of this lasagna! I think you will like it. It does take some time to prepare, one of my more time consuming recipes. I hope you enjoy it! It seems a little intimidating at first but it gets easier. In addition to my recipes my favorite resource for food ideas is Happy Herbivore. She has a lot of recipes online and 3 cookbooks. Email me if you have questions, I’m happy to help! What is the nutritional yeast for? Can you leave that out? Nutritional Yeast gives it a cheesy flavor. You could leave it out and it would probably taste fine but it wouldn’t be as close to traditional lasagna. The texture will be ok without it. It’s often found in health food stores or regular grocery stores in the health food section. Cannot wait to make this. We’ve been vegan for over about a year and a half and I’ve only made lasagna once using tofu as the filling. The entire family loved it. However, I am so pleased to find a recipe using beans (less processed). Thank you so much for sharing! Joan this lasagna is a little labor intensive but I think you love it. I’ve been wanting to make it but it’s summer now and just too hot for the oven. Hi Holly,thank you for sharing your awsome lasagne recipe! I used eggplant in place of lasagne, I cut it in strips put in the sandwich toaster to half cook it ,and made your marinated mushrooms and added them to the pasta sauce.My family loved it. You rock !! Kind regards. Karen. YAY! Karen those are really great ideas! I’m so glad your family enjoyed it. I’ve experimented with making it in the Crock Pot. I’m always looking for ways to cut corners so its done quicker. You could also make it with squash!